(CAMDEN, NJ) – The Freeholder Board is sponsoring the Camden County Veterans Job Fair for veterans, active duty military, members of the Guard and Reserve and military spouses on April 13, from 8:30 a.m. to 1:00 p.m. at the BB&T Pavilion on the Camden waterfront. 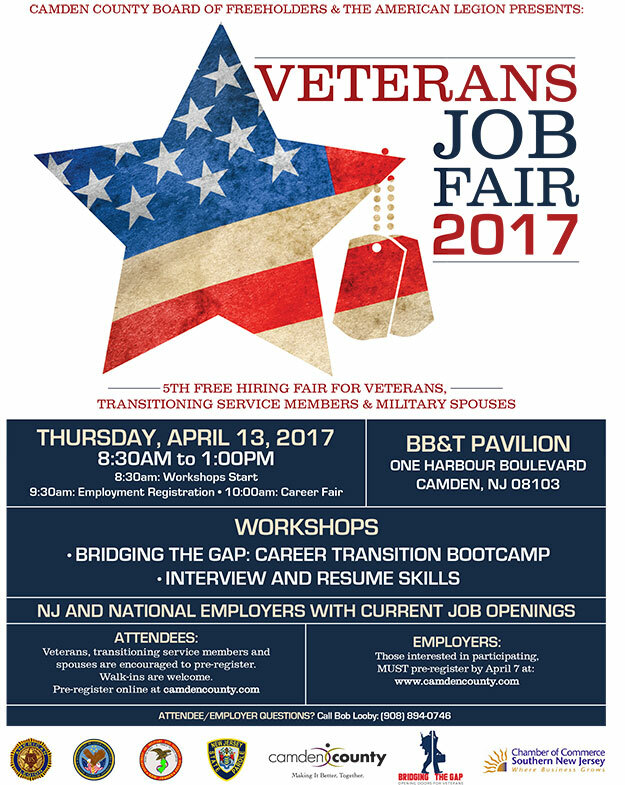 The free Camden County Veterans Job Fair will give job seekers the opportunity to meet face to face with more than 150 employers. In addition, workshops will be offered to veterans and other military job seekers that focus on interview techniques and resume writing, along with a career transition bootcamp. Many of the employers are new additions to the Camden City economic landscape including Holtec International, American Water and Subaru of America.